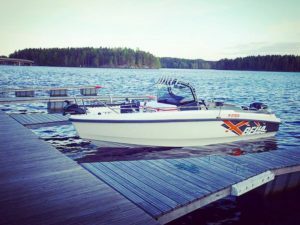 Boat i am using is a reliable new Bella 600R- model, which is customized to my special needs for professional sport fishing. 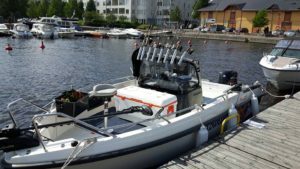 It has seats, which are easily modified within fishing and day-cruising. The boat is very stable under any condition in the water and just the hull weights 900 kg. It is made for rough sea conditions and are therefore very safe even in the big lakes. Lowrance fishfinders and map are latest tecnology, which gives an advantage and helps us to find more and bigger fish! 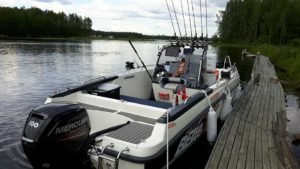 Boat can stand still with Motorguide trolling motor while fishing and it can be controlled with wireless remote or from the screen of Lowrance fish finders. Time can be spent just for fishing and anchor isn’t even needed now a days. I use always new and top of the line fishing gears made mainly by Patriot and Okuma. Lures & jigs are also best there is. 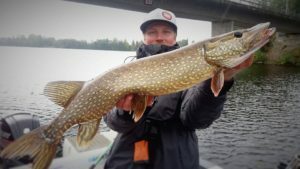 Fishing gear, boat, motors and fishing accessories are reliable and they help me through the long days, time after time. Actually, they are just in your use when fishing with me!